On April 3, 2009, Tom decided to go to Toledo for the day. It was a last minute decision and one that changed our lives. Tom left early that cold, rainy and windy morning. He was just an hour north of Dayton when he saw two beautiful black and white dogs in the median of interstate 75, in the midst of heavy traffic. He was amazed that the bigger dog, a male, looked just like a drawing I did of our first English Shepherd! He knew they were English Shepherds, and knew that he must rescue them. So he got off the interstate at the first exit he came to. Lyndie made it to the other side of the interstate, but sadly the male was hit before Tom could get back to them. After many phone calls and then finally with the help of a sheriff, he got the two terrified dogs in the front seat of his little truck and drove them an hour and a half back to our vet. The vet and techs said both dogs appeared to be between 2 ½ and 3 years old. They thought the male would make it if he made it thru the night. We kept close watch on him all day but in the early evening he began to get worse. We were so sad to lose the male that evening and he died in Tom’s arms with both of us crying. Lyndie’s sadness over losing her male buddy made us even sadder. I contacted shelters and humane societies in five counties surrounding the area where Lyndie and the male dog were found. No one ever called looking for the two beautiful but thin English Shepherds. We believe it is a miracle that Lyndie is with us we are thankful she came into our lives. Lyndie was traumatized when she got here but with care and patience-- way more patience than I ever knew I had, and getting her used to everything slowly, she began to trust us and her personality began to blossom. The first few weeks were painful for her as she was very sad, and afraid of everything we introduced her to. But she eventually learned to walk on a leash, ride in a car, and how to act around other dogs. We found that she is friendly to all people and is exceptionally gentle with children. She likes to lean on your leg while basking in being petted and touched. She is soft and sweet and has a very deep bark when they coyotes are around! She became our English Shepherd shadow, wagging her tail as she follows us everywhere—the perfect chore dog. Lyndie likes swimming the geese off the pond and swimming after radio controlled boats! So many of our friends fell in love with her and one puppy owner who had just lost her English Shepherd that she had gotten from us 14 years earlier, asked if we would breed her to our male so she could have a pup. This was an unusual situation and as I was thinking things thru, two more people called wanting a puppy from Treve. 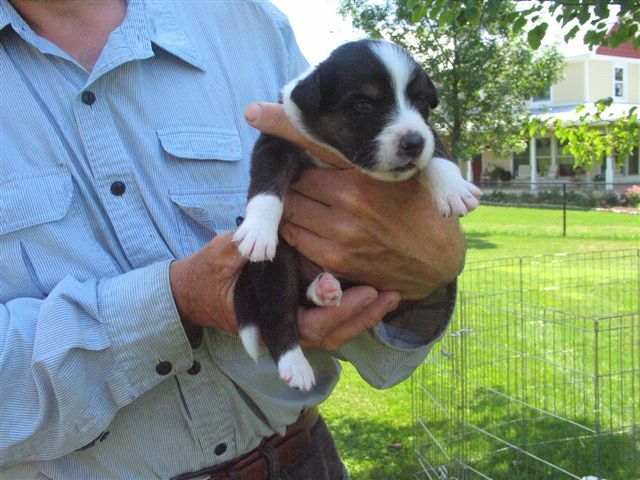 So with three folks wanting a puppy, it seemed meant to be and I found myself planning the things I needed to do to breed Lyndie to our Treve. We had a health check up on Lyndie, had hips xrayed, and MDR1 tests done. Then we needed to get her registered. After talking with JR Russell of the International English Shepherd Registry (IESR) where our other English Shepherds were registered, I learned what was necessary to do in this case to get Lyndie registered. We took her to a herding instructor to see her working style and how she worked with the sheep. Lyndie surprised me but not the instructor! Lyndie’s instincts overcame her fear of being in a new place! She showed she was brave with the sheep and she was biddable for Tom. We received a written evaluation from the herding instructor about the good potential Lyndie showed for herding and sent it in with other required information and photos to the IESR). We were thrilled when we received her registration certificate! 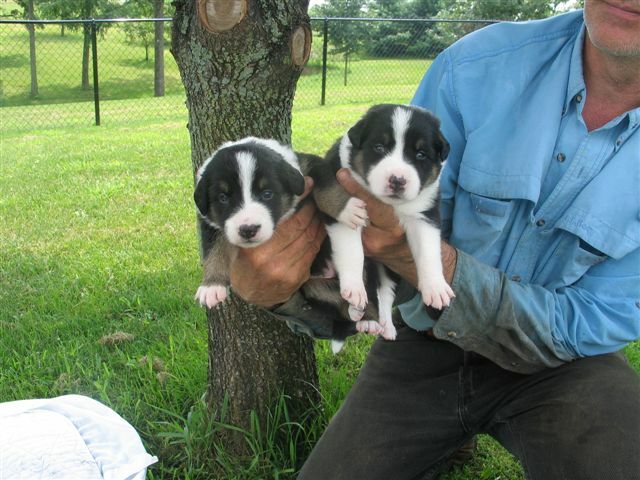 Lyndie and Treve had eight beautiful puppies in July of 09. 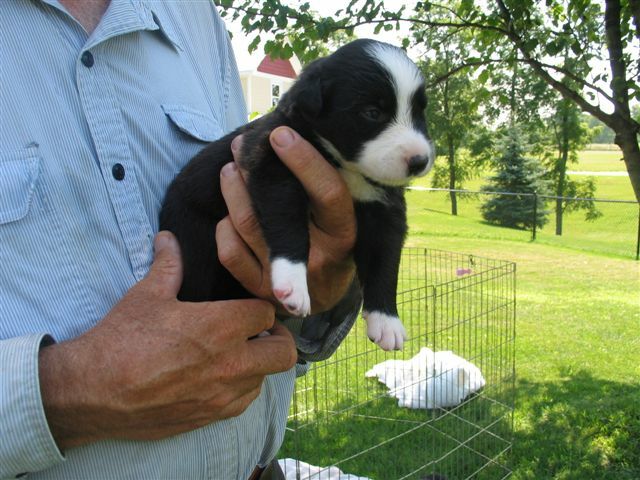 Six were black and white and two were tri color pups. We could see Lyndie had a litter before and she whelped easily and produced plenty of milk for her brood. She was an awesome mother and we enjoyed the whole puppy raising experience. Treve showed he was a fantastic Mr. Mom with his 7 week old pups! Without advertising, enough friends, puppy owners and a few other folks came our way to give eight pups wonderful homes. We are thankful for each and every one of those families. We have stayed in touch with all of our puppy owners, have received stories, and photos and some have visited us with their dogs or we have visited them! At eight months old, one pup was moving sheep, and recently was just introduced to the baby chicks he will watch over. One pup graduated from a beginner obedience class being the youngest dog ever and with the highest score since 1957! One pup spends her days with 3-5 young children her owner baby-sits for and she is exceptionally gentle with them all. One pup is getting ready to start agility and another herding. One pup goes to the horse barn everyday. One wakes her four year old boy up each morning by putting a ball on his bed. All the pups are good ball and Frisbee dogs and one is an outstanding soccer player! My six year old grandson played with him for a half hour and said the dog only missed two balls! We have learned a little about what the pups have become so far! Lyndie is great in the house, just happy to by near us. She loves sleeping on Tom’s lap with her head on his shoulder as he sits in the recliner in the evening. She likes to walk the horses out to the pasture with me and is careful around them. She heard me reprimand Bergie for barking and chasing at the fence when the horses and I were going to the pasture and gave Bergie a nip and Bergie does not bark anymore when we are walking out! Lyndie likes to keep things in order as our other English Shepherds do. Lyndie received her Canine Good Citizen certificate at our English Shepherd Gathering here in Sept of 09. I have to say I was teary, to think how far she had come! She is MDR1 normal/normal and her hips are OFA good. 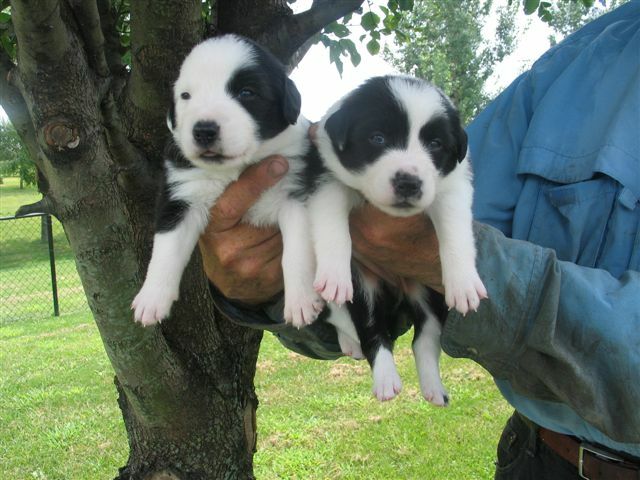 We bred Lyndie to Treve and on June 27th 2010 and eleven pups were born. We have seven males and four females. 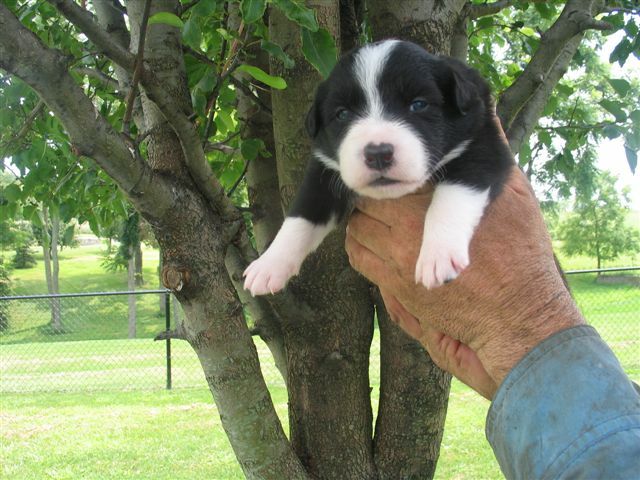 Three are tri color boys, two are tri color girls, four are black and white boys and two are black and white girls. 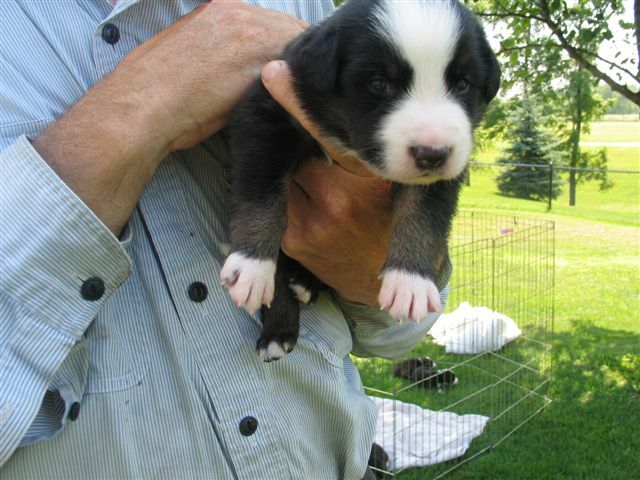 All have gorgeous markings, nice white blazes, big white chests, white collars, white feet and white tips on their tails. They are happy, healthy pups and incredibly cute! It has been a joy to care for them and watch them grow. 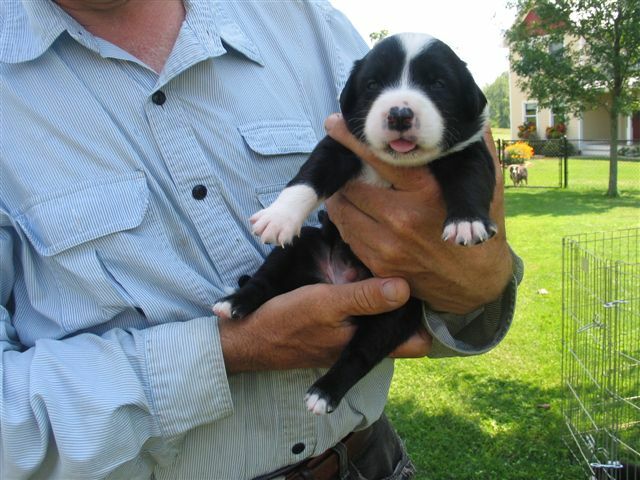 The pups are five weeks old and for now we have eight wonderful homes for them. Most pups are going to homes with friends who have gotten to know our English Shepherds over the many years and one to a new neighbor! We are enjoying every moment with the pups! I grew up with dogs, and can't imagine a life without them. A book of a boy and his dogs was a gift to me from my sister, knowing I would love it. Edgar Sawtelle, in this novel, is born in to a family who breeds and trains dogs. Though Edgar can hear, he cannot speak. He trains the dogs to follow his training with sign language. He spends hours upon hours with the dogs, not only in the barn, but walking the farm, spending time on the porch. His beloved Almondine, a Sawtelle dog who has watched Edgar grow from a baby to a hard-working boy, spends nearly every moment with him. They understand one another. This fictional tale makes me ponder the many things that we are born in to, the strengths and traits that might be woven in to our souls before we arrive and begin walking about on this old Earth. I never had the opportunity to know my paternal grandmother, who died in her mid-30s of a tonsillectomy gone wrong. My father, the oldest of the children, had to become a man at the age of 12. He took over her dog business as best he could, because it was the black and tan English Shepherds who helped to put food on the table. My grandparents raised hundreds of these puppies each year, shipping them in hand-made crates by rail car to all 48 states over the course of the years. It has always astounded me when older people in the community tell me they see many of her personality traits in me. I was born with a love of dogs, an understanding of dogs, that sometimes goes beyond reason. I have studied pedigrees, raised beautiful litters of puppies, enjoyed the process of matching each pup to the right family. For me, there is really nothing more rewarding than seeing that connection, happiness blooming in the new family as well as in the young pup. English Shepherds are known for their intelligence, their ability to become a working member of the farm family. I have witnessed it many times, and still it amazes me. Bill, a long-lived English Shepherd with whom I was lucky enough to grow up, knew when he was needed without being told. He herded up the milk cows from the far pasture right on time each day, knowing to treat the young heifers with more aggression, showing his tender side with the older matriarchs of the herd. He could sort hogs on market day in a way that defied human reasoning. "Well, I'll be darned. I wouldn't have believed it if I hadn't seen it with my own eyes," Earl Boyd once said when he came to load our hogs for market. Dad just smiled and said, "I've heard that a whole lot of times in my life when it comes to these dogs." We once sold a pup to a family in Minnesota. A few years later, we received a letter thanking us for the heroic dog. He had followed their son and nephew on a hike. Perhaps a bit too young to know better, they walked across a lake that was not completely frozen. The dog began barking frantically, refusing to follow them. The boys continued across, and fell through the ice. The dog pulled the first boy from the icy water and continued to bark frantically as the ice broke away with each attempt to save the other. A neighbor who knew the family well realized the bark was unusual for that dog. He jumped in his truck, arriving in time to save the boy with a rope and a whole lot of luck. I felt a whole lot like my dad when I wrote back, saying how pleased I was to hear this story, but that I wasn't totally shocked by the dog's determination and intelligence. I grew up hearing such great dog stories and treasure each one. It makes me wonder, as I always do, just how much our dogs are capable of learning and doing. I just know I wouldn't want to walk this life without them. Our English Shepherd Ellie, Beagle Brownie, and 14 year old Briard Cassie, joined me as I worked in the orchard early one evening. As I was heading back to the house, I didn’t see Cassie. She didn’t hear very well so I called and clapped but still didn’t see her. I didn’t worry because many times she went back to the house when she got tired. On my way to check to see if she was there our neighbors stopped by and we spent about two hours talking in the driveway. When I finally returned to the house, it was dark. I was shocked that Cassie wasn’t there. I called to Tom to help me find her and he said to head back to the last place I had seen her and he would be there shortly. I grabbed a flashlight and headed back to the orchard and called Ellie to join me. Since my English Shepherds know the names of all our dogs and all the people in the family, I told Ellie to “go find Cassie”. She took of running toward the cornfield. I remember thinking if Cassie was lost in the cornfield, it would be a long night of searching to find her. I shined the light in the direction that Ellie was heading and I saw her stop and look back at me wagging her tail. I ran toward her and couldn’t believe my eyes!! All I could see was Cassie’s head coming out of the ground! She had fallen into a large deep hole, a blow hole, made by a broken field tile. I ran to Cassie and found she was hanging on for dear life with her front feet and her back legs were just touching the ground at the bottom of the hole. I didn’t wait for Tom but was able to pull her out myself. She was exhausted and couldn’t walk so when Tom came he carried her back to the house. I felt terrible that I had forgotten to check on Cassie after our friends came by but was so thankful that Ellie know just where to find her. I remember reading in the English Shepherd Advocate in about 1993 that Pam Burgess’s dog Heather knew her husband’s name and I thought that could come I handy sometime. 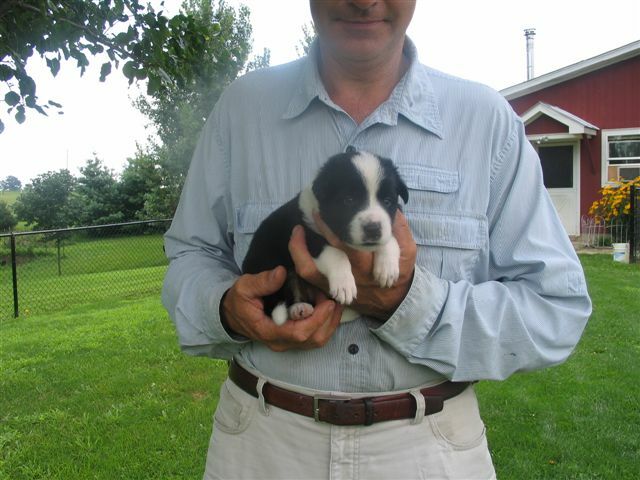 We had just gotten our first English Shepherd and until then I didn’t even know a dog could learn such a thing! It was easy to teach since English Shepherds are so bright. I just set the food bowl down for each dog and said his name each day and also said each dog’s name as I gave them a treat. It didn’t take long! Cassie lived to be 15 years old thanks to Ellie finding her! When Sloane was four months old he was already enthralled with his ball. He loved catching it, fetching, and finding it. Sometimes the ball would end up in the house where we might play a game of kick it. Sometimes it ended up under the old sectional sofa in the family room. Sometimes I wasn’t quick enough answering his high-pitched yip, which meant—the ball is under the sofa so hurry up and get it! One day when I was getting ready for work, I heard that excited high- pitched yip, but didn’t hurry out to get the ball for Sloane. He kept up the yipping and then there was quiet. Then I heard some unusual sounds. When I got to the family room, there was Sloane dragging the sofa with his teeth!! Just then he saw his ball, and I will never forget the look of happiness and surprise in his eyes as he saw it, then brought it too me! That was the beginning of me coming home and finding the sectional sofa pieces all over the room. My friends laughed and thought he was the perfect dog for me, since I was an interior decorator and always moving their furniture around. Well, it wasn’t too good for the sofa and we eventually had to replace it with one he couldn’t move! An exercise pen is made of 8 wire panels 24 inches wide and the best height for an English Shepherd is 36inches tall. It folds up to take up a space of 24x36x6. Use it like a crate and take it whenever you take your pup for visits. It is zinc wire and brass coated and has a door with two latches. You can set if up in a 4x4 square or whatever shape fits your space. It can be used instead of a crate or in addition to a crate but it is less confining than a crate, and the dogs can move around when they are inside it. Put the pen in a place on top of an easy to clean floor in a place where you will spend a lot of time so the puppy can be around the family and be part of things. You will use this pen thru housebreaking and thru the chewing stage. Without confining him when you are away, the chewing stage can become a chewing habit and be plenty destructive. Some dogs chew or worry more than others by the way. Follow these tips--It makes the job of housebreaking so easy you may say it feels like you never potty trained! Cover the floor inside the pen with newspapers and remove soiled papers quickly. Put the water bowl, a stuffed animal for company (the pup will be especially lonely those first few nights), toys, and a pillow or blanket. Feed the pup in the pen and throw a good treat on the floor inside to encourage the pup to go in on his own and make his choice to go in the pen a positive one. Keep the pup in the pen all night, and give him plenty of time out of the pen during the day, but anytime you leave or cannot watch the pup put the pup back into the pen. The pup will do a lot of sleeping the first two weeks you have him home. Let the pup sleep in the pen. The pup needs his own space, away from other dogs and kids. Do your part as always, by taking the pup out regularly—Immediately after meals, after naps, first thing in the morning and last thing at night. But if the pup needs to use the papers in between those times, that is a good thing and exactly what you want. And as you have seen, the pups are very well paper trained. You want to encourage the paper training at the SAME TIME you are teaching the pup to go outside in a special spot and always out the same door—you just won’t have all the worry if the pup doesn’t go when you take him out. He will later use the papers. You don’t have to worry about him having an accident when you aren’t home in time because you want him to use the papers. 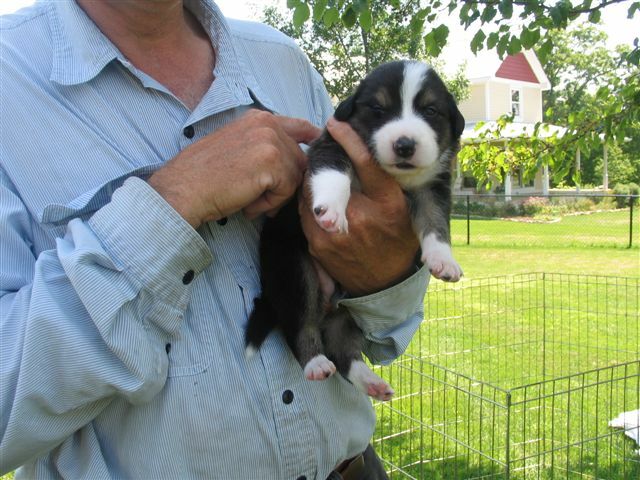 At around 10-11 wks the pup will be able to hold it longer and you will find less papers soiled. Keeping paper training going also keeps pups from having bladder infections from holding it too long when you are away longer than usual..
After a few weeks of unsoiled papers you may consider the pup MOSTLY housebroken. Always remember when the pup is out of the pen to keep a paper on the floor where the pup is playing and you may see the pup run to the papers in the midst of rough housing! Some folks really make themselves crazy potty training a puppy. They take the pup out every half hour or hour. It really doesn’t help the pup because most of the time the pup won’t have to go so he doesn’t get much chance to learn what he needs to do. It just encourages more times outside without success which is very frustrating for the owners and then the pup feels it. Potty training should be a positive experience with ridiculous amounts of praise! And when a pup doesn’t go, put him back in the pen if you cannot stay outside for a while or the pup will walk in and use a spot you don’t want him to use! And every “accident” is two steps backwards! Take the pup out the same door, to the same spot and when the pup pees or poops-- praise, praise, praise in your high voice, excited voice, and clap! Then play with the pup as a further reward! Anything to let him know he just did the most important thing in the world! Keep the pup in a small area—kitchen or family room and do not give him more space until the pup he can be trusted as housebroken. Giving the pup too much freedom too soon will make it easy for him to have an accident and cause housebreaking to take longer. Use baby gates to close off the room the pup needs to stay in. My vet tech and good friend Amie taught me this method 20 some years ago. I have used it ever since, it always works and makes housebreaking a pup a breeze.